Before you sail away out to the open water you’ll have to properly equip and get your boat ready. It is called rigging the sailboat, and in this article, you’ll learn how to do it. On some sailboats, rudder is removed after sailing to prevent it from wearing off or tearing while the boat is in the water. Because it is one of the crucial parts of your boat, you’ll have to reinstall it. Also, if it is not one of those you have to remove, you’ll have to check if everything is alright. On the top of the leading edge of the rudder there are pins attached, also known as pintles. They are inserted downward into round rings (gudgeons) that are attached to the stern. It is quite simple mounting the rudder, and you’ll see what goes where simply holding the rudder beside the stern. Some rudders already have a tiller mounted, but even if thy do, you’ll have to check it and make sure it is firmly attached and secure. And if your rudder doesn’t have a tiller, you’ll have to install it. If you wander what the tiller is, search for the big, thin bar. It is used as a steering lever and will help you control your boat. It is usually placed in a slot located at the rudder’s top, secured by a pin, which is then tied to the boat using lanyard, and will prevent it from being dropped. Your tiller can even have an extension which will allow you to control it while you’re sitting away from the rudder. When you’re sure that both the rudder and the tiller are in place, secured and properly connected, it is time to attach the sails. Sails wear off, they age and under the influence of the sun, the weather and the salt water their sailcloth could weaken. To slow this process down, it is recommended removing the sails after you’re done for the day. Or, if you have a bigger boat, covering them. So, if you’ve taken your sails off, it is time to get them back on, or so called “bend on” the sails. It is achieved by using the halyards. At the end of the halyard you’ll find a shackle. It is used to attach the grommet from the end of the sail to the halyard. Start by spreading the sail and identifying the sail’s corners. The narrowest triangle means you’ve found the “head” (top) of the sail. Attach the jib halyard shackle to it, make sure it is firmly secured. Continue by following the front edge called “the luff” until you reach the next corner. If you see the hanks with about a foot of distance between them, you’re there. The bottom of the luff is known as “the tack”. You should attach the tack’s grommet to the bottom of the forestay using a shackle or pin. When done, it is time to raise the sail. Start by locating the other end of the jib halyard on the port side of the mast facing the bow. Get a good grip on it with one hand and start pulling it in to raise it while you hank it on. Start to hank the sail from the nearest one to the head of the jib, open it and clip the hank to the forestay. It is quite obvious how to open the hanks, and they should automatically close when released. Watch for the sail and keep it straight and with not twists, then raise it further more and attach the second hank. Do the same until you’ve reached the luff and are sure they are all in order and the sail isn’t twisted. Lower the jib back down and switch to the jib sheets. If you look at the cockpit, you’ll see two lines, one on each boat side. They are called jib sheets. The jib sheets could differ from boat to boat. On most of the small sailboats, they are tied to the sail’s clew and remain with the sail. If your boat is bigger, they may be separated and need to be tied to the clew. If there is not a shackle, use a bowline to tie them to the clew. When they’re tied, run the sheet back past the mast to the cockpit. They could run inside or outside, it depends on the boat type. Use the starboard jib sheet cleat mounted on the deck do secure it and keep it in its place while you sail. Now it is time to raise the mainsail. Start by spreading the mainsail and identify its corners, then continue by attaching mainsail halyard shackle to the mainsail’s head (the narrowest one). Secure the mainsail’s tack by adding the removable pin through the grommet. It will secure it on the boom and make the luff secured from the head and the tack. The third step is to secure the clew and foot (bottom edge of the sail) to the boom. To secure the clew to the aft end of the boom, use the outhaul line. On the other hand, the foot doesn’t necessarily need to be secured to the boom, as some boats have a rope sewn into the foot which slides into the boom. Some work on a “loose-footed” manner, which allows more sail shaping, but prevents sails from flattening as much. Once you’ve got clew secured and you’ve tightened the outhaul, secure the mainsail’s luff to the mast. Aft side of the mast has a groove from the mainsail. Some have boltrope which slides upward in this groove, others have slugs (plastic slides) on every foot on the luff. When you’re sure your sail isn’t twisted, hold the halyard in one hand and start raising the mainsail by inserting the slugs into the mast groove. But beware – when the mainsail is up you’re starting to sail, so make sure you’re ready and everything is checked and alright! If you’re sure you’re ready and prepared, continue raising the mainsail with the halyard by inserting slugs into the groove. When the mainsail is up, pull the halyard, it will tension the luff. When done, tie it to the mast cleat with a cleat hitch, and you’re almost good to go. But before you do, lower the centerboard into the water if you have one. If you don’t, you have a keel, which is fixed in place. It will stabilize your boat and prevent it from sliding sideways. Go to the jib, pull the jib halyard and cleat it to the other side of the mast. Now that you’ve raised both sails and, tighten the mainsheet and a jib sheet which will adjust the sails and get you moving forward. Then turn the boat and let the wind fill the sails from one of the sides. If you’re caught “in irons” (facing the wind), push the boom to the side. It will push the back of the mainsail into the wind – or “back the sail” and start the boat rotation. And as soon as it catches the wind, you’re good to go! If you’re done for the day and are taking the sails down, it is good to know how to store them properly and keep them in a good condition as long as possible. 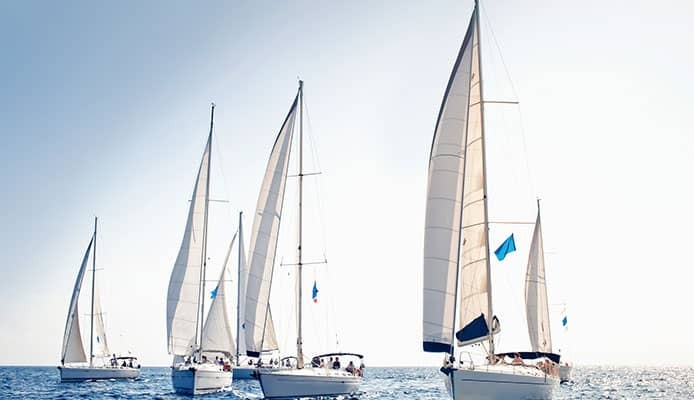 They need to be kept away from moisture, extreme temperatures and pests, because these can easily ruin your sail. Moisture increases the chances your sail will get stains or mildew. On the other hand, extreme temperature damages laminates, and high temperature could change the shape of sail. Keep it away from the sun, in shade and possibly hanged so it doesn’t touch anything. Another danger comes from mice or rates. They love rolled up sails as it represents secure environment, it is cozy and can be used as a sleeping place and is full of salt. If you have a rodent problem, you could end up with the holes in your sail, but also feces and urine stains. Same story is with insects. To prevent anything similar from happening, hang them. If you lack the space, fold them carefully and place them on a shelf, but keep it away from the walls. If you do this, the will wait for you to come back safe and sound. OK, we’ve been through the process of boat rigging, and now it is time to go through things you’ll need and will make you ready and prepared for the sailing. The first is harness. It is one of the most important things as it will keep you safe while you’re outside, on the water. Then comes the clothes. Remember, you’ll be surrounded by water and will probably get wet. Wearing regular clothes could not just be unpleasant and cold if wet, but it will also reduce your ability to move. Having clothes specially made for wet conditions on will keep you functional and will keep you warm while you’re having fun. Combined with sailing shoes, of course. The fourth thing you’ll need is a compass. It is important to know your position, and it will help you avoid possible problems or get lost. Another good investment is a watch, to keep your sense of time alive. Also, don’t go out without the personal floating device or a lifejacket. Most of them have a LED light activated by water, so if an accident happens it is easier to spot it. And last but not the least – a knife. Sailing is unpredictable, which makes it fun, but also dangerous if weather becomes bad or something happens, your ropes get tangled and you have to react quickly. A good knife that can easily cut through the ropes could help you and save you a lot of trouble. Also, remember – there will be lots of pulling the ropes, so it is a good idea to have gloves on your hands. And for your personal comfort it could be nice to wear a hat and sunglasses. – Life Raft should be considered as a priority, because, as stated above, weather can change, it could surprise you or something could happen and the life raft could save your life. – Grab Bag is something that has everything you need if you have to go to a life raft. Rigging the boat seems complicated, but when you do it first few times, it will become something natural and easy. If you can’t remember what to do next, make a checklist and go step by step. Once you get a hold of it, you’ll find yourself having fun just rigging your boat. It is important to do it right way, as it will keep your boat work properly, but it will also keep you safe as it will, if done the right way, keep the chances of losing control of your boat minimal. If you’re unsure on how to do something or how to achieve something, don’t be afraid to ask. Visit your marina and you’ll find lots of sailing-loving people who’ll be thrilled to help you. Also, it is not a bad idea to take a quick sailing course, where you’ll learn how to properly rig your boat step by step. As long as you’re willing to learn and ready to face the challenge, it will be fun and interesting. So, don’t hesitate – this guide should be enough to get you started. If you feel like you’re stuck – ask someone. 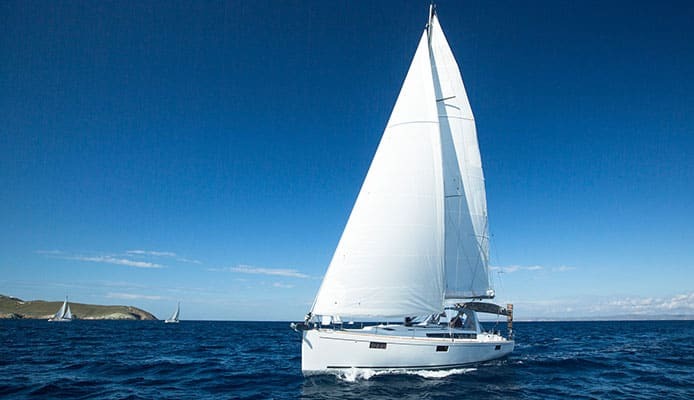 And last, but not the least – the main purpose of sailing in 21st century is to have fun. As long as you don’t forget it, you’ll be just fine. And wear the sunscreen!